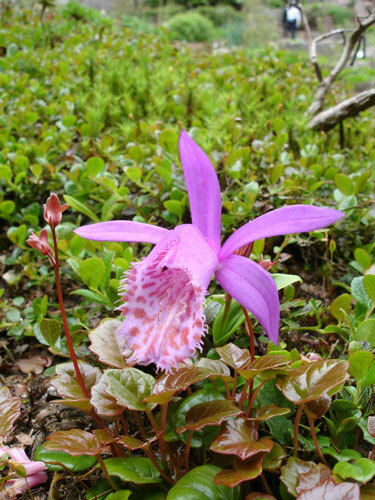 Pleione, the Peacock Orchid, is commonly sold as a "bulb", because its underground pseudobulb appears somewhat similar. (There is also a Gladiolus with the same common name, even though it's not an orchid.) Though these are not bulbs, they can be grown somewhat similarly in mild temperate climates. These terrestrial-orchids have beautiful flowers, usually combining shades of pink, purple, yellow, and white. Species from higher elevations bloom in spring, lower-elevation species bloom in fall. Coelogyne is a related genus, and likewise originates in the foothills of the Himalayas. Distributed under the Creative Commons Attribution 2.5 Generic license. These are cold hardy orchids down to freezing, but they don't appreciate summer temperatures much above 80°F (27C). If you live in an area where winters freeze regularly, you can dig their pseudobulbs up and put them in the refrigerator during the winter. (If your winters are too warm, say, above 40°F, or 5C, the refrigerator is also a good idea!) If you're using a refrigerator for the plant's "winter", feel free to grow it indoors on a windowsill for the "summer"! Summer temperatures should be 70-75°F (21-24C), cooling by 10-15°F (6-8C) at night. They should be planted with part of the pseudobulb sticking out of the ground, though some like to be completely buried. Experiment and see what works best for the species you're growing. A good potting mix includes sphagnum moss and fine grade fir bark. Actual soil is too dense, you want something more freely draining. See the terrestrial orchids page for more information on the sorts of potting mixes to use. These plants are used to a summer monsoon, so don't let them dry out too much once they start growing; water just as they approach dryness. Watering too much when they aren't actively growing will contribute to rot. Humidity should be high, about 70%. If growing them outdoors, you probably don't have much control over this, but they should do fine in most areas, as long as you're not in an arid environment. They like bright light as orchids go, but direct sun is usually too much; dappled shade outside works well. I suggest 2000-3000 footcandles of light.